And there was that business in New Frontier, yes, I know. So my old pal Brandon asked me on the Twitter the other day if I’d ever written anything on this here comic book blogging website about DC’s 1960s “War That Time Forgot” series in Star Spangled War Stories . And honestly “soldiers fighting dinosaurs” is second only to “Native Americans fighting dinosaurs” when it comes to the Best High Concept Comic Book Premise of All Time. As it turns out, for me personally, as a collector, I had room for only one “________ fighting dinosaurs” comic book in my ongoing quest of unknowingly building stock for the eventual opening of my own comic book store, and Turok Son of Stone was the funnybook what got the nod. That’s not to say I didn’t try…I did have a few of those Star Spangled s in the Vast Mikester Comic Archives over the years, but had long since traded them off for other comics more to my liking. Not that I didn’t like them…they were goofy fun, and well drawn as DC’s war books often were, but I decided I couldn’t collect everything and decided to part with them. A large portion of these stories have been reprinted in one of DC’s black and white “Showcase Presents” softcovers. My pal Brandon hopes for a second volume, but the Showcase line’s output has slowed down considerably, and despite that, I don’t think there really are enough of the War That etc. 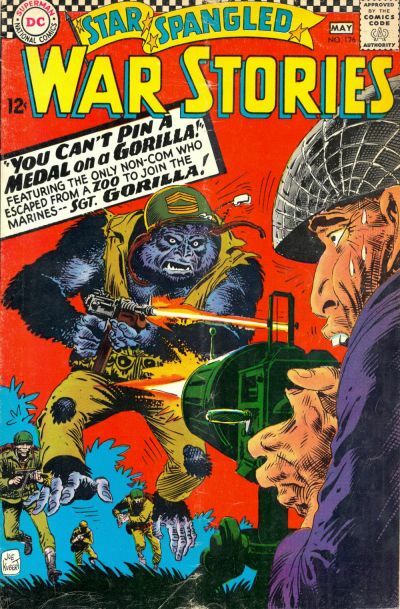 tales to fill a second volume, unless DC padded it with other oddball stories from their war books. There ain’t no shortage of those, surely. TWTTF was revived a couple of times in G.I. Combat and Weird War Tales , so maybe those can be plugged in as well. And there were more modern revivals in a couple of DC mini-series from within the last decade or so, but those wouldn’t fit tonally. That’s all probably moot, anyway, as unless there’s a War That Time Forgot: The Movie And/Or TV Show on the CW Starring Good-Looking 20-somethings Playing Teens Playing Dinosaurs in the works, a Showcase volume 2 or some kind of color omnibus aren’t going to happen. NOTE TO READERS: this is where you jump into the comments and tell me that Amazon has a Volume 2 listed for a 2018 release that I somehow missed in my Googlings. I do remember, at the previous place of employment, that we received enormous numbers of requests for these throughout the 1990s and maybe into the 2000s, and DC’s war books were hot hot hot. I don’t know if that’s quite the thing any more, as I can’t recall the last time we had folks banging our doors down for them, but I imagine there’s still some brisk business to be done in old dinosaur war comics. 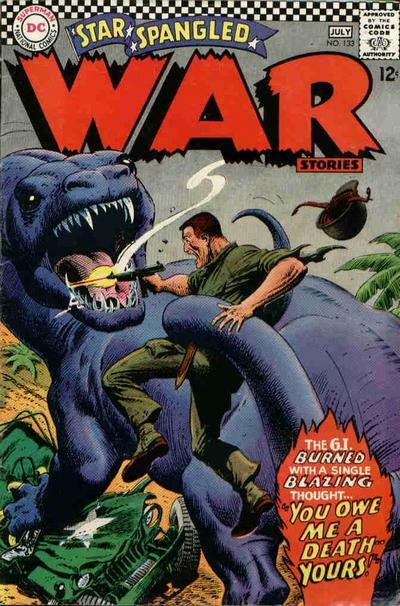 I mean, c’mon, “dinosaur war comics” is a phrase that forever pays…surely they’re still circulating among fans new and old. Possibly the only story better than soldiers or Native Americans fightin’ dinosaurs is that. In case you’re wondering…yes, I had that issue in my Star Spangled s and kept it when I sold off the others. I have the complete Sgt. Gorilla run, and couldn’t bear to break it up. Thanks for doing this, Mike, and curse you for introducing me to Sgt Gorilla. I have bought the first War that time forgot showcase, mainly because it had the “fake” Suicide Squad in it. The stories were mostly a mixed bag and a bit too formulaic for me. I’d say these stories work better in small doses than in the Showcase presents format. Thanks for mentioning the Guns of the Dragon series.It was exceptional, a real underrated gem from the late 90s. With a surprise villain to boot. The War that Time forgot, unfortunately, not so much. I only made it to issue 7. Of course, he is not a Native American, but back in the day everybody looked like a Paleface anyways. I stalled out about halfway through the Showcase collection – every single story was basically the same. Even the ones that tried to introduce some continuing characters. I adore my Showcase collection of The War That Time Forgot. It’s big, dumb fun. I’ve been slowly reading it over the last few years (like all my Showcase comics, I never read them cover-to-cover, but read a few stories at a time when the mood strikes and time allows) and despite the aforementioned formulaicness (I’m making up words now) it never disappoints. That particular Gorilla is wearing more than enough of a vest that pinning a medal on him doesn’t seem to present any particular problems at all. Great stuff! Oh man, that Sgt. Gorilla one! I checked out some covers after reading this. The art is so fun! My favorite is the giant prehistoric sea crab clutching a submarine. Hilarious! I have that volume! Wacky, old stuff!